Indium Corporation has the production capability to deliver levels of up to 99.999%-pure (5N) tin. 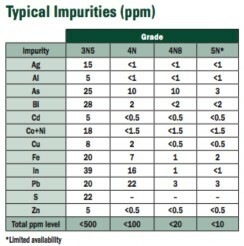 Testing is available upon request for specific impurities. Indium Corporation delivers a single-source solution, from mine to packaging, for high-purity tin materials. The company offers tin in a number of physical forms and purity levels of up to 5N or 99.999%-pure. With a melting point of 505.08 K (231.93°C or 449.47°F) as well as its corrosion-resistant nature, tin is becoming increasingly popular for a number of new and innovative applications, including aerospace and semiconductor. For more information, visit www.indium.com/tin or contact Donna Vareha-Walsh, Director Metals Business Unit, at dvareha-walsh@indium.com.